That’s the transition a downtown Bangor eatery location will be making this spring, as Portland Pie Company has announced its plans to open a new location on Main St in Bangor. When owner Tabitha Johnson closed Verve Burritos in Orono in late February, it seemed the writing was on the wall for Verve’s Bangor location as well. Less than two weeks after the Orono location shut down, the Bangor location closed its doors at at 89 and 91 Main St., paving the way for Portland Pie Co. to open its northernmost branch to date. Portland Pie CEO Jeff Perkins anticipates a June 2019 opening. “We’re always being asked ‘when we are coming to this town or that town’ and we are continually and actively exploring those options. For us, opening a new location in Bangor is such a great opportunity to become part of a strong community, which is what we are all about,” Perkins said in a statement released Wednesday. Founded in 1997, Portland Pie has expanding since 2014, opening locations in Biddeford, Brunswick, last year in downtown Waterville. They have two locations in New Hampshire as well. There is also a plan for a Lewiston location, but it’s opening has been held up due in part to the prolonged federal government shutdown in December and January. Abe and Heather Furth originally had originally opened Verve Burritos in 2009 in Orono. The Bangor location opened four years later. The Furths did major renovations on both buildings before opening each location. Last June, they sold Verve Burritos to Johnson, a longtime manager at the Bangor location, but retained ownership of the buildings. 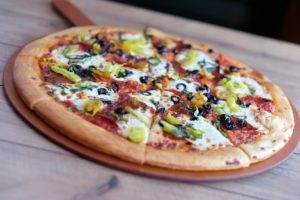 In an interview with Jennifer Van Allen of Mainebiz.com, Perkins talked about expansion, and said community and good pizza are what the company is all about. For more in formation on it’s latest expansion, Portland Pie Company can be found on multiple social media platforms, including facebook, Instagram and twitter, or visit their website.